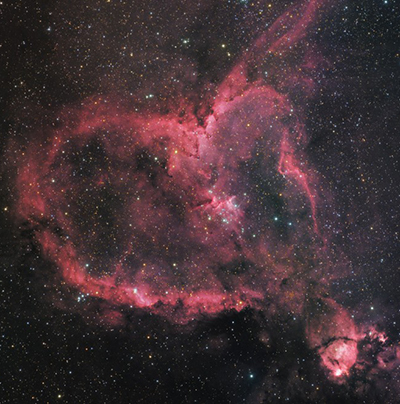 The Heart Nebula, (also labeled as IC 1805, Sh2-190), a space gas cloud that looks like a heart, lies in the Cassiopeia constellation, about 7500 light-years from Earth. It's a cloud of ionized gas producing light of different colors. It's a mix of dark dust clouds and glowing interstellar gas. The nebula is formed by plasma (a state of matter) of ionized hydrogen and free electrons. This cloud spans to almost 200 light-years across. The knot on the right of the picture, the brightest spot of the nebula, is seperately called as NGC 896. It has a seperate name because it was the part discovered before the other parts of the nebula. Nebula's instense red color and structure are derived from the radiation coming from a small group of stars in the middle of the nebula. This cluster of stars called Melotte 15, contains several large stars which are up to 50 times the mass of our Sun, and more fainter stars which are only a fraction of the mass of our Sun.